These donuts are a fun morning treat. 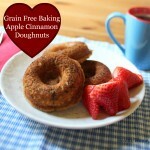 The donut muffin pans allows us to make donut shapes out of grain-free batter and without the mess of deep frying. Preheat oven to 350 F. Grease a doughnut pan. Whisk coconut flour, cinnamon, baking soda, and salt together in a large mixing bowl. In a separate mixing bowl, beat the egg yolks with honey, coconut oil, and apple juice. Then pour them into the dry ingredients, and beat until smooth. Beat egg whites until light and fluffy. The, fold them into the batter. Bake about 20 minutes. Allow them to cool until comfortable enough to handle, then gently remove them from the pan and set them on a cooling rack. Sprinkle with additional cinnamon, and serve.